We’d love your help. Let us know what’s wrong with this preview of Royal Regard by Mariana Gabrielle. When Baroness Bella Humphrey returns to England after fifteen years traveling the world with her husband, an elderly diplomat with only months to live, she has plenty of surprises in store: a new title and sizable fortune, the attentions of the marriage mart, and a budding friendship with the new King, George IV. As she settles into her new life, this shy, not-so-young lady When Baroness Bella Humphrey returns to England after fifteen years traveling the world with her husband, an elderly diplomat with only months to live, she has plenty of surprises in store: a new title and sizable fortune, the attentions of the marriage mart, and a budding friendship with the new King, George IV. To ask other readers questions about Royal Regard, please sign up. 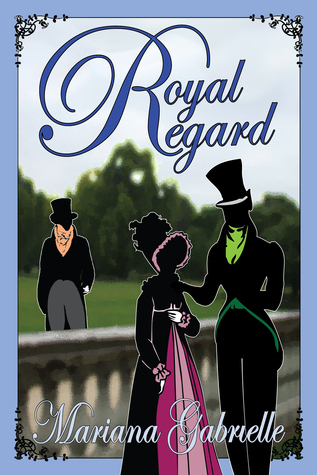 Offers so much more than the usual Regency Romance fare, ROYAL REGARD is complex, witty, and thoroughly entertaining. Highly recommended. Royal Regard is a five star book. The characters are well drawn, the plot exciting, with many twists and turns, and a building sense of suspense, and the dialogue excellent. Bella returns from overseas with her elderly husband Myron, who has come home to die after 15 years representing England in many foreign lands. The couple are friends of the recently crowned King George IV. Bella is painfully shy, but has learnt to hide her insecurities behind a mask of competence. Myron and the King are worr Royal Regard is a five star book. The characters are well drawn, the plot exciting, with many twists and turns, and a building sense of suspense, and the dialogue excellent. Bella returns from overseas with her elderly husband Myron, who has come home to die after 15 years representing England in many foreign lands. The couple are friends of the recently crowned King George IV. Bella is painfully shy, but has learnt to hide her insecurities behind a mask of competence. Myron and the King are worried about how she will cope as an extremely wealthy widow. Two dukes woo her, both with ulterior motives. One is a rake with a fear of emotional commitment, and one is a fortune hunter who hides some grim secrets behind a charming facade. Bella must cope not only with the vicious tongues of society's gossips and her own unpleasant memories of England, but also with the determined assault on her senses of two practised seducers. Royal Regard gripped me from the first. I particularly enjoyed the interchanges between Bella and her dukes - Marianna Gabrielle writes clever, witty, and thoroughly convincing dialogue. As the rake begins to grow up and realise what Bella means to him, the fortune hunter decides to take decisive action. To avoid spoilers, let me just say that I had to put the book down at that point and wait till I could finish it in one sitting, because I could see that Bella had invited a traitor into her house and I was fast approaching the point where I had to know what happened next. In the last part of the book, Gabrielle - having resolved the external conflict - is able to zero in on the internal conflict. Both the hero and the heroine grew through their experiences and gave me a satisfying ending that totally convinced. I have one minor quibble, and it may yet prove to be nothing. The heroine's brother turns up three quarters of the way through the book and stays for 100 pages before disappearing again. He seemed unnecessary to me. On the other hand, he could be good for a sequel. I did want to know what had happened to him in the years he'd been estranged from his sister, and what would happen to him next, which is a credit to Gabrielle's deft outline of his character. Please Dear Lord let there be a second! The book begins with Bella attending a party of her cousins in London. After traveling with her husband for Doreen years abroad, the last thing Bella wants to do is spend time at some party with a bunch of snobby socialites but she does it to appease her cousin. It is here we are introduce to Nick. Nick is a man in his forties and is best known for bedding married women. He is entranced by Bella instantly, not for her good looks as she is known to most as b Please Dear Lord let there be a second! Nick is a man in his forties and is best known for bedding married women. He is entranced by Bella instantly, not for her good looks as she is known to most as being plain and referred to as ugly, many times in the book. But it is her strong, smart wit that Nick adores. Bella's husband is elderly and suffers from an extreme case of gout and he knows that is illness is worsening and he also aware of Nicks fondness towards his wife, so he approaches Nick with a proposition, to marry his wife so that she will have protection from men who will try to swoon Bella out of the fortune, he leaves her after his death. But Nick has no desire to wed anyone and as avoided it his whole life. Royal Regard is not your typical Regency novel. Mariana Gabrielle has skilfully created a cast of characters which defy many of those conventions other authors rely on. Her hero and heroine are neither very young nor classically beautiful, but they work their way into the reader’s affections with effortless ease. The villain is as oily and despicable as any romance reader could wish and the supporting players are all clearly defined. The plot starts steadily, then builds and builds as the story u Royal Regard is not your typical Regency novel. Mariana Gabrielle has skilfully created a cast of characters which defy many of those conventions other authors rely on. Her hero and heroine are neither very young nor classically beautiful, but they work their way into the reader’s affections with effortless ease. The villain is as oily and despicable as any romance reader could wish and the supporting players are all clearly defined. The plot starts steadily, then builds and builds as the story unfolds, with many twists to take the reader by surprise and keep them turning the pages until a most satisfactory conclusion is reached. In this her debut Regency novel, Mariana Gabrielle has taken the trouble to check for correct usage of Regency terms and phrases, which, sadly, so many authors do not, and avoided the murky waters of ‘Americanisms’. She gets my thumbs up for that alone! So, if you want a rattling good read to brighten the dank January evenings, try this for size. This is an era I really don't know that much about. Between Bess, and Victoria I really haven't ever cared about the time periods in between, especially in Fiction. Pride and Prejudice, basically any of the Jane Austin novels never did anything at all for me. However, I found myself excited through out most of this book The little attentions to details made me easily find myself within the realm the author created, it was easy to step within this world in my dreams. That to me is the sign of an This is an era I really don't know that much about. Between Bess, and Victoria I really haven't ever cared about the time periods in between, especially in Fiction. Pride and Prejudice, basically any of the Jane Austin novels never did anything at all for me. However, I found myself excited through out most of this book The little attentions to details made me easily find myself within the realm the author created, it was easy to step within this world in my dreams. That to me is the sign of an excellent book. I could smell and taste, and feel the senses that the characters experienced. I easily rate this book 5 stars. I'm used to writing reviews for books that fall into genres of usual preference: historical and literary fiction, history, and topical nonfiction. Reading Royal Regard, a Regency Romance novel, and writing a review have been ventures into the unknown and mysterious. Happily, I can say that Royal Regard was a most enjoyable experience. Author Mariana Gabriele is a proven professional writer and editor, and my high expectations for quality of writing and editorial excellence were soundly met. The s I'm used to writing reviews for books that fall into genres of usual preference: historical and literary fiction, history, and topical nonfiction. Reading Royal Regard, a Regency Romance novel, and writing a review have been ventures into the unknown and mysterious. Happily, I can say that Royal Regard was a most enjoyable experience. Author Mariana Gabriele is a proven professional writer and editor, and my high expectations for quality of writing and editorial excellence were soundly met. The story is set in an era which was unfamiliar to me; some preliminary research revealed that the cast of principal characters are part of a world of rarefied aristocracy and wealth that makes the upstairs crowd at Downton Abbey look more to the middle-class side. Story and character development proceed at a brisk yet comfortable pace. Female lead Isabella (Bella) Huntleigh, a member of the minor aristocracy cast out by her family but come to wealth and high social position by way of marriage to a good and sympathetic man of commerce twice her age, finds herself in the middle of the treacherous environment of the highest London society after a dozen years of traveling the world with her husband. To complicate Bella's new and unfamiliar circumstances, her husband Myron, Lord Huntleigh, is known to be dying and she known to be the sole beneficiary of his vast estate. Bella is a complex young woman, shaped both by her grim childhood and her happy yet passionless marriage to Lord Huntleigh, beautiful of person and socially adept, but deeply lacking in confidence and seemingly unaware of her effect on the predatory male aristocrats who immediately begin to circle her like hungry sharks. I don't think she is ready for the attention she gets from the rogues of London. As a matter of fact, I think she would rather be just about anywhere but London for the season. Her husband has the King's ear and so they must remain. She must deal with 2 suitors, both waiting out her husband's failing health. Two Dukes no less. Both very forthright, both handsome, both vying for attention she does not want to give. Her husband, Myron, being much older, only wants to protect her, he has settled his fortune on her at the time of his death and he wants to make sure she does not fall into the trap of a fortune hunter. His protective instincts prove true. But who is the rogue and who is sincere? Her cousin Charlotte is not helping matters. Her head is full of romance. Will Belle be safe? Will Myron live long enough to see her with the proper Duke? No spoilers here! I really liked the twists in this story! They were written well enough to keep me guessing, though some things were quite obvious, I never knew what might befall the heroine of the story next! Poor Bella, she just wanted to live in the country, away from the gossips and rakes and the people who talk of nothing but hair and dresses. 4.5 Stars - Review to come. I have just tuned the last page and feel bereft. It seemed a lifetime passed in the pages of this amazing story and I did not want it to end. Skillfully plotted with the characters coming to life off the page as I smiled and cried with them. Myron and Bella have returned to London after being away for fifteen years. With her older husband in bad health he wanted to find her a husband to take care of her when he was gone. What you say? Are you serious? Yes and it all makes sense. Bella would be a I have just tuned the last page and feel bereft. It seemed a lifetime passed in the pages of this amazing story and I did not want it to end. Skillfully plotted with the characters coming to life off the page as I smiled and cried with them. Myron and Bella have returned to London after being away for fifteen years. With her older husband in bad health he wanted to find her a husband to take care of her when he was gone. What you say? Are you serious? Yes and it all makes sense. Bella would be an heiress and would have no protection. Basically sold to her husband Myron by her father and brother she had traveled to many foreign lands and overall been content and seemed to shine by her husband's side. But society held against her some of the “unsuitable “ places for a woman she had visited. Being thrown into the London scene, Bella felt inadequate and really disliked being whispered about by everyone. She found herself quickly pursued by two gentlemen, both dukes. Nick and Aldolphe set out to seduce Bella but each for different reasons that were not apparent at first. Nick becomes to realize, the more time he spends with Bella that he is truly starting to have feelings for her. Aldophe on the other hand hides his true self until little by little his nefarious reasons for pursuing Bella come out. As the story twist and turns, truths come out and the realization that danger lurks becomes evident. I really enjoyed this story but at times I wanted to shake Bella and tell her to quit pulling Nick along. She had an obsessive devotion to her husband which was really understandable due to all he had done for her and treated her well. Also he really wanted her to be set when he was no longer there and only with the best man. I’d forgotten how much I enjoy a good regency romance, and so glad that I decided to read Royal Regard. This is my first exposure to Mariana Gabrielle’s work, but I’m hooked. Her characters are well rounded and realistically crafted, and I found myself fully invested in them from the get go. What I especially enjoy about this genre, is that falling in love with someone that you’re actually married to wasn’t at all the norm. In fact, it seems that while women would swoon at the thought of a “lov I’d forgotten how much I enjoy a good regency romance, and so glad that I decided to read Royal Regard. This is my first exposure to Mariana Gabrielle’s work, but I’m hooked. Her characters are well rounded and realistically crafted, and I found myself fully invested in them from the get go. What I especially enjoy about this genre, is that falling in love with someone that you’re actually married to wasn’t at all the norm. In fact, it seems that while women would swoon at the thought of a “love match”, many of the male characters I’ve come across would see the open display of affection as a weakness. The standard for marriages seemed to be that they were more a strategic tool to further a family’s connections, than anything to do with depth of emotion between a couple. Sure, you might come to like the person you were with, but women had few rights and a multitude of pitfalls in the ever-changing social scene that they could find themselves a victim of. In my mind, a female was little more than a uterine cultivation device (sounds better than “baby maker”). This was why I loved Bella’s innate strength so much. She’d had such a difficult upbringing. The only female in a household of rough, sometimes abusive and scheming males, she wasn’t at all confident in ton society. Having basically been brokered away into a marriage to a merchant twice her age, she’d spent the last fifteen years touring the world with him as his wife and diplomatic support staff. You’d think she would be bitter, unsure, and easily victimized; nothing could be further from the truth. Bella had balls (sorry for the visual) that rivaled any of the males she’d encountered along the way. I was fascinated by her ability to cut down any man who behaved indecently, while being so utterly unsure of herself as a female. What a complete dichotomy. Her journey to finding herself certainly had its ups and downs. That’s okay though; I’ve always thought that anything worth having should be worked for. She was smart when it wasn’t fashionable, and I had to give her a lot of credit for remaining true to herself, in spite of the staggering amount of external pressure to conform. Nick (Duke of Wellbridge) was the quintessential rake. He gambled, dallied with married women, and made a career out of walking the fine line of acceptability. I’m sure if he hadn’t enjoyed such a close relationship with the King of England (I cracked up every time someone used the King’s nickname, Prinny), he’d have been a social outcast. What I loved best about him is that Nick saw in Bella, what so many (except her husband) overlooked; she was a unique and resplendent creature who’s allure would last long after her peers’ beauty had faded. Make no mistake; he thought she was beautiful, but more than that, her wit, intelligence, and innocence drew him like a moth to the flame. I liked that Nick was smart enough though to play the part of the rake, while living his life on his own terms. He wasn’t a bad guy; he simply had no interest in having his days mapped out for him in regard to a wife and family. He’d seen how unhappy his mother and father had been, and was in no rush to enter into that arena. I thought he had many redeeming qualities – it was just a matter of paying attention to what he didn’t say or do to uncover them. As with many romances, the hero and heroine are the only ones not aware that they’re already in love. Sometimes watching them come to the realization can be tedious, but no so with Regard. I loved watching them deny it at every turn – it almost reminded me of Rex Harrison in My Fair Lady, when he sings about being “accustomed to her face”. These two were a perfect foil for one another on so many levels; and I think that was the essential ingredient to their loving relationship. Let’s not forget though, that Bella was already married. Her husband, Myron, might have not had the romantic relationship that set his wife’s heart aflutter, but he was no less in love with her. He knows that his success is in a large part due to her support and insight, and has no issue with stating it. He loves her sarcastic wit and I in turn loved Myron. Mariana Gabrielle wrote an exciting plot that was filled with more twists than a corkscrew, and kept me on the edge of my seat throughout most of the book. There were many moments where I was surprised by a turn of events, so much so, that I know I could easily read the story through again and come away with additional insight. Even if you aren’t usually attracted to the Regency romance genre, I think you’d find Royal Regard a thoroughly enjoyable read. This book is already on my TBRA (To Be Read Again) list. Although this is Book #1 in the series Sailing Home, I highly recommend reading the prequel Shipmate. One will get a little backstory and more insight to the relationship between Bella and Myron. It is mentioned that theirs was not a love match. A marriage of convenience that proved to be just the thing a wallflower like Bella needed. Royal Regard takes place after their return from their many adventures abroad (After Shipmate). Back to London, where Society tongues wag and gossip is second nature. Labeled a nouveau riche couple and their lifestyle barely making them acceptable make things hard for Bella, who despises all activities within the Ton. Bella and Myron are admired by the Prince or Prinny and the fact that royalty holds them in regard, do they actually have a some standing in Society. But the barely veiled dislike for a woman who speaks her own mind, who is sporting a tan from her adventures, and who is not pretty by any standards, is fresh meat to all who acquaint themselves to her. All know the vast age difference between Bella and Myron, and his failing health make her a new target for fortune hunters. Enter two Dukes who actually duke it out with each other over Bella. A new experience for her, to be sure. Bella is not your typical heroine. She is shy, yet witty, a wallflower through and though. But she is not pretty and it pained me to read how often she was called ugly. Her sharp tongue had me grinning and I loved the dialogue between Bella and her cousin Charlotte (whose story you can read in Mistletoe, Marriage, and Mayhem). It was a refreshing take on a Regency set story, that focuses more on the more realistic aspects of marriage, love, and people’s agendas. Bella’s temper, however, sometimes proved to be her downfall. Those scenes that showcased her temper actually had me wincing because I knew she would regret those actions and words right after her outburst. To set it apart from other Regency romances, this one actually made me think that she ruined her chance at Happily Ever After forever. It really kept me on my toes. Speaking of love of her life, Nick was a very enjoyable hero to read about. A man that can handle Bella’s temper has my respect for sure. He is described as a handsome rake who had his fair share of dalliances and love affairs. So of course Bella doesn’t trust him in the beginning. But to trust the French Duke that constantly showers her with compliments and sexual innuendos, blush at his attentions, really made me want to roll my eyes at her lack of common sense. I went into this book knowing very little about it, having only given the blurb a cursory glance. But it was Regency, and I adore Regency novels, so I bought it from Amazon when I needed a bit of comfort reading on my Kindle. I'm very glad I snagged it. This is a more intricate, twisting tale than those I've read by Marion Chesney or even some of Heyer's work. Just when I thought everything was about to be wrapped up in a neat little bow, as I'd come to expect from other books of this genre with I went into this book knowing very little about it, having only given the blurb a cursory glance. But it was Regency, and I adore Regency novels, so I bought it from Amazon when I needed a bit of comfort reading on my Kindle. I'm very glad I snagged it. This is a more intricate, twisting tale than those I've read by Marion Chesney or even some of Heyer's work. Just when I thought everything was about to be wrapped up in a neat little bow, as I'd come to expect from other books of this genre with a more formulaic feel, the plot took off again, the characters rounding another bend. It was well written, with imperfect - in other words, human - characters complete with foibles and the struggle of having to overcome the deficiencies in their behavior towards each other. In Royal Regards,Bella Holsworthy returns to England after being abroad with her now ailing husband. Although Bella is world wise,she is not adept to the society that she has been thrust back into. She has two very determined Dukes paying her court,a king and husband playing matchmakers,and her own heart and mind to deal with. I absolutely loved this book! Bella is such a strong,smart,witty,and loving character that you just want to step into her shoes. It will take an amazing man to match up to In Royal Regards,Bella Holsworthy returns to England after being abroad with her now ailing husband. Although Bella is world wise,she is not adept to the society that she has been thrust back into. She has two very determined Dukes paying her court,a king and husband playing matchmakers,and her own heart and mind to deal with. I absolutely loved this book! Bella is such a strong,smart,witty,and loving character that you just want to step into her shoes. It will take an amazing man to match up to Bella! Never fear though, the author was more than up to the task. Mari Christie uses her writers pen in such a way that the characters,settings and plot are all full of life. Bella Holsworthy has much to be thankful for - having escaped an abusive family by marrying a much older gentleman (a gentleman she came to have a deep affection for) & having that husband teach her how to have confidence in herself. All while living at sea for fifteen years. Now back in London due to her husband’s failing health has Bella’s old insecurities of the ton warring with her confidence. Myron, Baron Holsworthy, knows he is not long for this world and wants to die knowing he has do Bella Holsworthy has much to be thankful for - having escaped an abusive family by marrying a much older gentleman (a gentleman she came to have a deep affection for) & having that husband teach her how to have confidence in herself. All while living at sea for fifteen years. Now back in London due to her husband’s failing health has Bella’s old insecurities of the ton warring with her confidence. Myron, Baron Holsworthy, knows he is not long for this world and wants to die knowing he has done everything he can to protect Bella from fortune hunters upon his death. There’s one he would warn her away from & one he would push her towards. Charmed by a rakish Duke & wooed by a charming Frenchman but staying loyal to her husband has Bella in a constant state of confusion. Evil rears its ugly head with the help of a deceitful maid, a kidnapping, interference from her ailing husband & the king have Bella fleeing. But will she flee to a life of loneliness or can her happy ever after find her and who will it be with? A character yelling, heart stopping story by the talented Mariana Gabrielle. Just when you think Bella’s going to get her HEA Ms. Gabrielle turns you around. Love Bella’s strength, her devotion to her ailing husband, the hero being broadsided by his feelings and the final twist of the story. Looking forward to Ms. Gabrielle’s next tale! Bella Clewes, Baroness of Holsworthy was never considered a pretty woman and people enjoyed telling her so. She hated Society and the one good thing about being sold as a bride to a much older man was that she got to sail away from all of it. Now after fifteen years away, Bella and Myron return to London due to his failing health. The strong woman she had become while away...was once again quiet and unsure. Adolphe Fouret, Duc de Malbourne and Nicholas Northope, Duke of Wellbridge...both started to try and charm Bella. Only one of them cares more for the true woman she is. The other knows she is soon to be a very rich widow. Bella just wants to remain a good wife and caretaker to Myron. This was a very unique story and I found it to be a definite page turner. Grabbing you and holding you from beginning to end. Bella is still a married woman and yet many around here seem to forget...or just ignore...that. Myron knows he is not long on this earth and wants to find Bella a protector. The prequels are to follow: Shipmate is Bella and Myron's story. 'Tis Her Season is Charlotte's story, Bella's cousin. A Rose Renamed is John's story, Bella's brother. What a terrific introduction to Regency Romance! Packed with atmospheric description and impressive characterisation, and sizzling with occasional breathtaking intimacy, Royal Regard is a wonderful read. The plot intrigues from the off, twisting and turning its way through a substantial narrative to a fascinating and satisfying climax. Above all else, the dialogue deserves the greatest acclaim and Gabrielle offers a masterclass in this respect. I'm a UK reader and found all the characters and the What a terrific introduction to Regency Romance! Packed with atmospheric description and impressive characterisation, and sizzling with occasional breathtaking intimacy, Royal Regard is a wonderful read. The plot intrigues from the off, twisting and turning its way through a substantial narrative to a fascinating and satisfying climax. Above all else, the dialogue deserves the greatest acclaim and Gabrielle offers a masterclass in this respect. I'm a UK reader and found all the characters and their perspectives utterly authentic as they drew me closer and closer to every single scene. I started this book in the morning and kept reading until it was finished. It was that good! Bella and Myron have finally come home after 15 years of traveling the world. Myron, the much older husband, is not well and wants to ensure Bella's future and happiness. He sets about choosing her next husband, which fascinated me. I can't think of another book that had that particular story line. The story moves very quickly and left me wanting more at the end. I am hopeful that Mariana continues with th I started this book in the morning and kept reading until it was finished. It was that good! A very interesting story, but poorly written. A lot of the writing is vague and confusing. Sometimes important information is left unsaid or implied in conversations. I liked the hero a lot, bit the heroine was silly and way too dramatic--I did not like her at all. The major of the horse guards went from being mistrusted and almost killed to honored and a person with more authority than the hero, in the space of a quarter of a page. I loved the two prequels but not this one. The Duke of Wellbridge is witty, charming and seductive. It is easy to despise him and desire him at the same time while Bella and her cousin Charlotte are two characters that carry a great deal of the story and are immensely entertaining. Read full review in the 2015 June issue of InD'tale Magazine. Mariana Gabrielle is a pseudonym of Mari Christie, a professional writer, editor, and designer with almost twenty-five years’ experience. Published in dozens of nonfiction and poetry periodicals since 1989, she began writing mainstream historical fiction in 2009 and Regency romance in 2013. In all genres, she creates deeply scarred characters in uncommon circumstances who overcome self-imposed bar Mariana Gabrielle is a pseudonym of Mari Christie, a professional writer, editor, and designer with almost twenty-five years’ experience. Published in dozens of nonfiction and poetry periodicals since 1989, she began writing mainstream historical fiction in 2009 and Regency romance in 2013. In all genres, she creates deeply scarred characters in uncommon circumstances who overcome self-imposed barriers to reach their full potential. She is a member of the Bluestocking Belles, the Writing Wenches, and the Rocky Mountain Fiction Writers. Her first Regency romance, Royal Regard, was released in November 2014.